We all have fun with the Wii, since the remote can be used to play many types of games. But can it control the Mindstorm NXT or NXT 2.0? Yes, by using DarwiinRemote on Mac or Glove Pie on PC, you can easily remote control your Lego Mindstorm NXT or NXT 2.0 with your Wii remote. In this tutorial you will learn how to connect your wii remote to your computer, how to get your computer to recognise it and then how to use your wii remote to control aspects of your computer. In this section you will gather all the hardware you need (if any) and install all the software you need for the easiest and most straight forward setup. You will first of all need to check if your computer has bluetooth built into it, many don’t, check the specs on your computer somehow; either have a look at the box it came in or have a look on the internet and it will tell you if it has bluetooth interregated. Next you need to get your software, your going to need some sort of program to manage your bluetooth conenctions; “BlueSoleil” is perfect for this. You can download the limited version off the offical site (links below) or you can download a version with keys so you can register it (links below) however you don’t need the registered version for this tutorial. After you have downloaded it, unzip it, then just follow the install instructions. You will have to reboot your computer after the install. Next you will have to download “GlovePie” this program allows you to execute scripts that interperet what you are doing on the wii remote and link them to do something on the computer. First of all download it from one of the links below. Next unzip it, then to run the program you just run “GlovePIE.exe” no need to install anything. Now were goin to get our Wii Remote ready, take the back off of it so that the little red sync button is clearly visible and accesable. Were going to hold the sync button while searching for devices using BlueSoleil. You will now notice you don’t need to hold the sync button anymore and the lights on your wii remote are continously flashing, this is a sign that it is now connected to your computer and you are now ready to launch some scripts. wiimote.Rumble = 1 which makes the wii remote rumble. It then states that if the user clicks down on the wiimote it stops rumbling. Just copy and past the code in and click run, then click up on your wii remote and if your remote starts to vibrate you know that it is setup properly. Click down to stop the vibrating. GlovePIE also comes with lots of example scripts for you to use. I think that’s basically it, if people like this tutorial I might make some more advanced ones to do with what you can do once you’ve got your wii remote connected. 2. To connect the NXT go to bluetooth from the main menu and hit search. The NXT should find your computer. Once it does, select it, select a port, then search for bluetooth devices from your computer. The NXT will ask for a passcode, just put whatever you want, I used 1234. Put in the same code on the computer when it asks for it. The computer will now connect to the NXT. In IVT BlueSoleil you have to right click the NXT after you found it and select pair. 3. To use the Wiimote on your computer you need a program called glovepie. Actually you should’ve done this already. Once you have the code in press run. The wiimote should have 1st and 4th light up. 4. To connect the program to the NXT, you need a program called OnBrick. (Web site can be found here). And now the fun part. I will show only how to configure the program for one motor, the rest is pretty the same. You will configure the function for the Wiimote left button. Go to RC tab. Press the small yellow box bellow Fwd1. On your screen this is shown as ZigZag!!!! Press Clear All. Enter the name (whatever you want). Next to the name field you can see F1. Remember this line from the code entered for Wiimote “Key.F1 = Wiimote1.Left” – this is what should happen when you press F1 or the left button on Wiimote. Press the first blue arrow- forward 20 cm. You can leave this as it is. Press ok. Now if you press F1 the motors connected to B and C port should start for a short while. 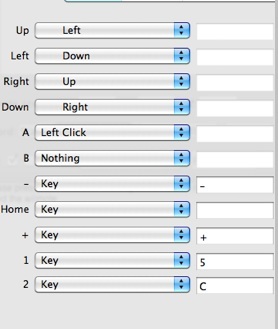 Now press the left button on Wiimote … If it’s not doing the same something is wrong. Please remember that the NXT OnBrick should be the focused program! The rest should be easy from now. Please do not forget to check the key for each option. For ex: Tune is for key F2 or the right arrow on wiimote. This a Mindstorm Wiimote Controlled Car. Here are the following instructions you need to follow to build this robot. 1. You will need the Mindstorm software and DarwiinRemote . (This software is for Mac users. You can find a PC version by searching on Google). 4. Click “ok” and then click on find wiimote. After connecting to your wiimote, launch the Mindstorm software. 5. Click on tools remote control to connect to your NXT. Then push action five times. Now you are ready to control your robot. (Note: After you click on action five times, don’t touch your computer. If you do, click action five times again to fix the problem).